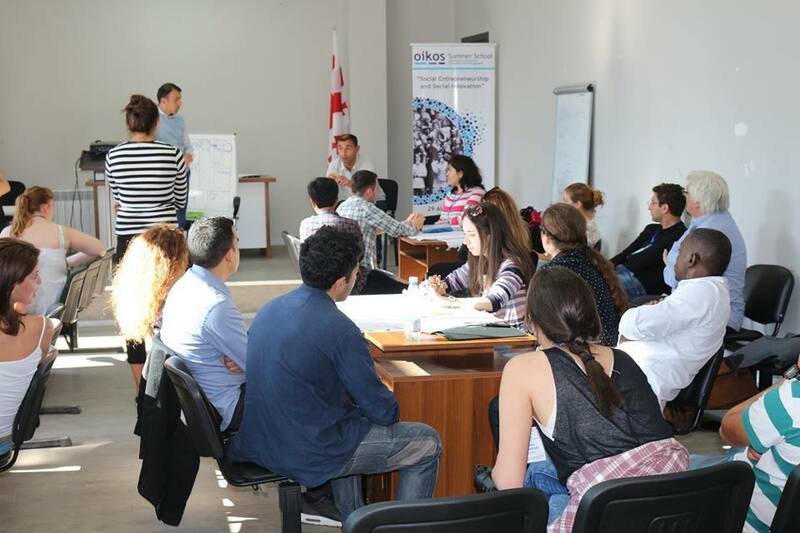 The oikos International Summer School on Social Entrepreneurship and Social Innovation was a 9-day event for international and Georgian participants that took place in Mestia, Georgia. Forty participants from eighteen countries gathered in order to learn more about the topics and actively transform the Svaneti region for the better. Through various lectures, workshops and field trips, participants acquired knowledge on the meaning of social entrepreneurship and how it relates to innovation. They were also exposed to the topics of campaigning, financing, how to advance your own ideas, creating values through one’s business and more. The workshops were delivered by Socionext, our partner for the Summer School. The hands-on approach, which allowed participants to directly apply the knowledge learnt on Svaneti cases, was energetic, constructive, and thought-provoking. By working in teams throughout the 9 days, participants developed real businesses for the region: one related to the entertainment industry reusing an abandoned building, one related to water, one related to preserving cultural heritage and one selling an almost lost tradition of drinking Rakhi. Local participants from Mestia were consciously involved in order to make a local difference. They were exposed, like the other participants, to an international perspective on entrepreneurship and how to implement sustainable principles in developing countries, especially. Locals were actively engaged in the development of the ideas, who will hopefully be pursued on the oikos VBI. With the businesses developed during the Summer School, locals will be able to keep the social entrepreneurship spirit alive in the region. Moreover, success will be achieved if more entrepreneurs will be born, which will lead to sustainable development in the region. After having engaged in the Socionext workshops and the development of business ideas in the first 6 days, the 7th day entailed a workshop on behalf of Ian Choo. Ian dived deeper into the concept of entrepreneurship with the participants and brought alternative perspectives to the table. Participants then met with the Director of the partnering foundation and the Deputy Ministry for Youth Affair. At the beautiful museum in Mestia, participants presented their work in front of a wide audience and were successful at doing so. Participants then received their certificates. On the 8th day, participants traveled to Ushguli, the highest village in Europe. There they connected with nature and discovered the importance of maintaining cultural heritage. The Summer School was concluded by a typical Georgian buffet dinner and a wonderful cake. On the final day, a 9 hour bus journey awaited participants to move back to Tbilisi. Amongst the fatigue and happiness of the past few days, participants expressed enrichment and stopped at a wonderful restaurant on the way right next to the Prometheus Caves. Post the Summer School, the oikos VBI will be utilized. As mentioned above, the oikos Virtual Business Incubator is an innovative aspect of the event, it is an online platform, which will become a guarantee of success for business ideas. It will answer modern business incubator challenges. Through which users will have online room, where they exchange with experts and learn more about entrepreneurship practices. Users can do many things, amongst which, test their ideas through various models, such as the canvases. Overall, participants showed in their feedback that they have achieved a better understanding on the topics and appreciated the, sometimes too fast, hands on approach. Thank you to everyone who made this Summer School possible and until the next time!